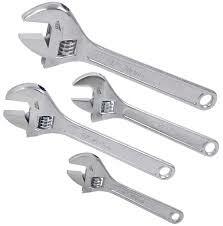 CAW4P 4 pc Adjustable Wrench Set Sizes: 6",8",10" and 12" . Triple chrome plated chrome vanadium polished steel. Rugged I-beam handles. Includes storage pouch.